Martin Truex, Jr.‘s No. 56 team went from full-time to part-time status in the blink of an eye. Well, Pocono was fun. Or something. At one point it seemed more like bumper cars at 200 mph than actual racing. Then again, who ever expected the Big One to happen at the triangle, a track long considered one of the most boring? The overall culmination felt like a disjointed mess of a race, which means it’s not all that surprising that the ratings once again equaled those of a daytime re-run of Covert Affairs. 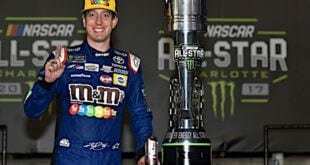 No need to harp on the ratings – they’ve been crap all year – yet the funny thing is that NASCAR Sprint Cup Series races still draw a few million viewers and, on some weekends, win the day. So really, it’s a mixed bag. The question will be, now that many people have concluded that the regular season isn’t all that special, will they turn the channel back to cars going in circles or will it be too late? Because when that thing called the Chase starts it’s football season! Heck, it’s football season right now; in many ways it’s never not football season. How’s your fantasy draft look? That sixth-round selection is going to be tricky. 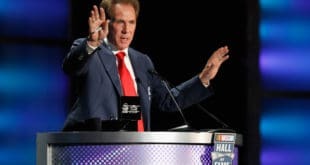 Now that football will be banging around the Chase, which is the part of the NASCAR season that is supposed to enthrall, with what will fans be left? It’s a question worth asking now and revisiting after Homestead. Then again, if Dale Earnhardt, Jr. wins the title then everything should be fixed, right? Right?! Happiness Is… Indifference. Last week Happiness Is pointed out that the Joe Gibbs Racing No. 11 team lost nothing by trying to cheat out a win at Indianapolis. Sure, Denny Hamlin lost some points and his crew chief, Darian Grubb, but the overall net effect was zero. 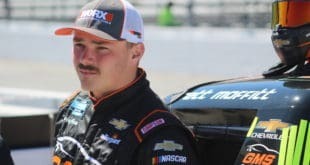 The fact that the “suspended” crew chief is still allowed to be in contact with the team, even on race day, makes the situation all the more laughable. Exactly what is a suspension, NASCAR? Now word out of the Gibbs organization is that the team won’t even bother appealing the penalties. Hm. So NASCAR brings down the hammer on Hamlin’s team and there’s no need to appeal the ruling. That would seem to mean that it’s pointless, because what really matters is that Hamlin is in the Chase. Until NASCAR figures out a way to truly penalize a team, this kind of instance is likely to occur more frequently rather than less. Good for Hamlin and co. for figuring out a sizable loophole. Happiness Is… Darian Grubb. Thank you for the championship season – now later, tater. Any chance that Tony Stewart would like a do-over? After earning his third Cup championship, Stewart kicked former crew chief Grubb to the curb. The followup pairing of Stewart and Steve Addington didn’t seem all that special either, but at least they were competitive and made the Chase. Late last year he chose Chad Johnston to be his new man atop the box. That’s right, the legendary Chad Johnston who has done, hm, exactly what? Oh, that’s right, he won once in three years with Martin Truex, Jr.
Let’s assume Stewart is fully healed; as gruesome as his injury was, a year should be an acceptable recovery timeframe. So is Johnston a good crew chief? Is he likely to be around next year? Does Stewart-Haas Racing have deeper problems, having expanded to four teams and switching up nearly every important position in the offseason? Is it all Danica Patrick’s fault? Even better, should Stewart have taken Greg Zipadelli up on his offer to return as crew chief last year? For everyone that cites the summer stretch as Stewart’s “time,” it doesn’t look like that’s the case this year. Yeah, it’s probably Danica’s fault. Happiness Is…The Glen. 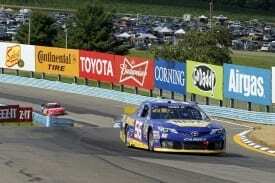 Marcos Ambrose wants this race bad; the Richard Petty Motorsports team went so far as to test at Watkins Glen to ensure that Ambrose has everything he needs to earn his third victory at the track. Bold move. It also shows the importance of the Chase money. The organization is putting all its eggs in the proverbial basket for Ambrose to take the win and put both RPM cars into the Chase. While that would be cool to see them both there, teammate Aric Almirola being the other, would they really be competitive? It’s not like they’ve been running up front with Jimmie Johnson, Brad Keselowski, Joey Logano, Earnhardt and Kevin Harvick. So while it would be a feel good story, it would be also one that is swept aside right after the first race of the postseason. Ah, the Chase, how you do NASCAR wrong. Happiness Is… The Glen, Pt. II. Hey, if The Expendables can have three installments, Happiness Is can recycle things too, but in this edition of the Glen, things really get interesting. Well, that’s the hope anyway. The road courses continue to provide some of the most interesting in NASCAR. Between the close-quarters racing and the ability to rub and sometimes dump another car, there’s a different mentality when the cars go both left and right. While Ambrose will get a deserved amount of attention, is there anyone else that could sneak in at a track like this one? Could someone like AJ Allmendinger get it done here? The chances are not likely. Sonoma seems to bring about more surprising winners than the Glen. This track seems to favor the richer teams, with Ambrose being kind of an asterisk to that idea. The past 10 winners have all come from solid organizations, with Stewart, Kyle Busch and Harvick dominating the list. Look for that trend to continue – unless some crew chief decides to take an early risk and go off-strategy. Happiness Is… The Glen, Pt. III. It’s back, and this time the Glen is that much more extremely awesome. That’s right, enjoy the race at the Glen because the next race is Michigan. After the last race at Michigan, which could be a case study in turning people away from the sport, what might the ratings be for the one next week? Egads. My only question is why should I care about the Championship? Thats not what I watch races for. Seems to me its just something to justify the amount of money they try to hold up sponsors for. I feel pretty much the same way. I watch each race as a separate entity without much concern about last or next week. While the Chase is possibly the silliest way to award a championship NASCAR historically has had an odd way of picking a champion. I’ve never figured out how 5 second place finishes was better than a win and 4 DNFs. One that consistently comes close but never wins is known as a loser everywhere but NASCAR. When football starts, nothing else matters. Period. For me, everything else is dead at this point. Indifference? Yeah well NASCAR and the TV partners have done their best since the “chase” or joke as someone else called it to make the majority of the races not worth watching. I really have no interest in the championship these days because IMO it is such a farce. I do like watching racing and if the people producing the tv broadcasts show it, then its fine. Stewart did indeed shoot himself in the foot with firing Grubb. I thought he was a jerk about it and since I’m not a fan of his, I personally think he got what he deserved with his choices for crew chief since then.